Partyforumseasia: Since Thailand’s Armed Forces have taken over a quasi political party status for the time being, it may be allowed to look into its past some 120 years back. This early piece of picture journalism (a precursor of photo journalism) was printed in 1893 and discovered by Partyforumseasia on a holiday in France. Le Petit Journal, according to an advertisement in this copy published 29th July 1893, had a circulation of more than a million daily. It shows the great interest of France as one of the big colonial powers in Southeast Asia in the military strength of Siam. The text of the article highlights the structure of the army (whose commander was prince Devang Wonsee, a brother of the king), the armament and manpower, about 10.000 soldiers altogether. Foreigners were hired as riding instructor, British, and head of the naval force, French. 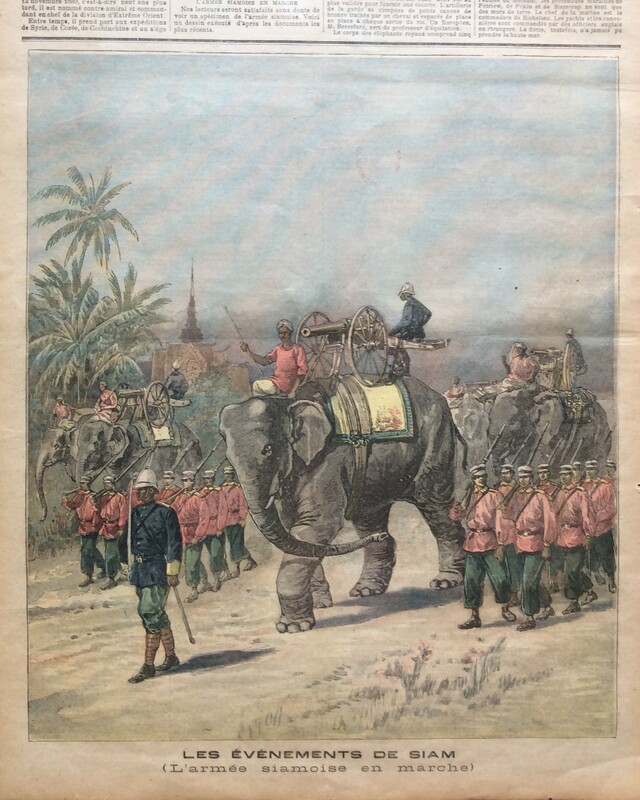 The picture suggesting that the royal elephants carried cannons on their backs is maybe a European exotic fantasy. The text says that they are prepared for warfare (“parfaitement dressés pour la guerre” but normally carry the king and the princes in big ceremonies. In the absence of political parties in the 1890s it is clear that the army was the main political instrument of the king of Siam.